Safari is made from a fuzzy yellow material covered in brown patches. He has large purple and black button eyes and black stitching for his nostrils. His hooves and the inside of his ears are made from purple fabric. He has a white muzzle and two tiny white and black horns on top of his head. Safari the Giraffe was introduced on 1st February 2010. This is the small 6″ version of Safari. 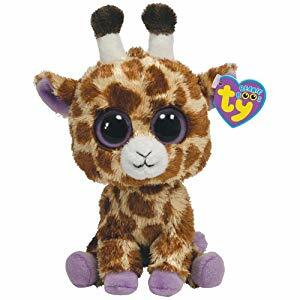 He was also released as a medium 9″ Beanie Boo Buddy, in two versions of the 16″ size (standard and glitter eyes) and as a key clip.